Another story from the Getty Villa: A wall dedicated to the labors of Theseus reminded me that this particular Greek hero on two different occasions got a little Jamie Lee Curtis and bumped off twisted serial killers to make safer the highways and back alleys of the ancient world. Both stories match silly and macabre in just the right proportion that either one could have been adapted into a bad ‘80s slasher film and I don’t think anyone would have bat an eye. 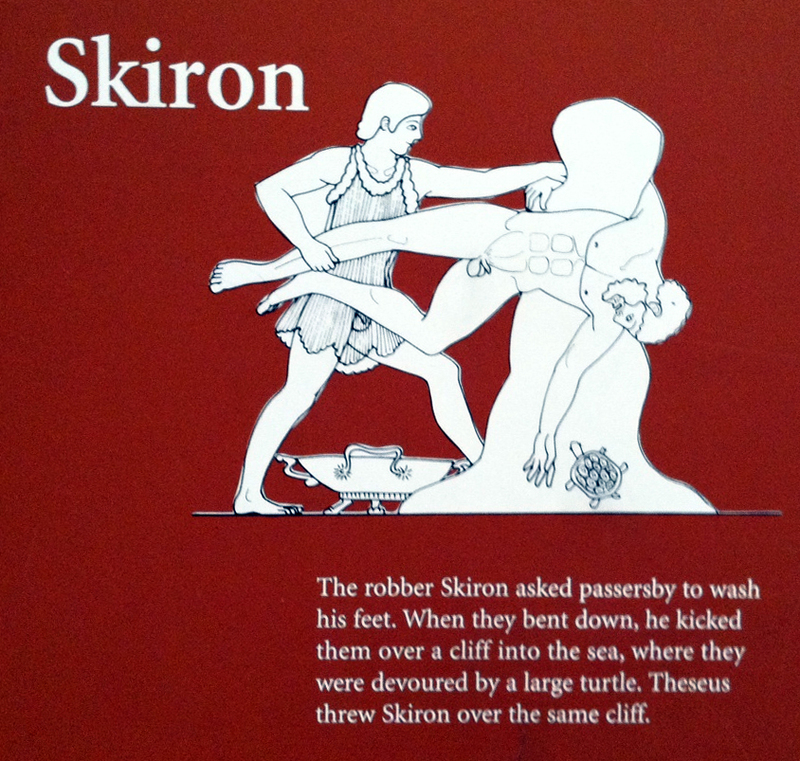 The first, Skiron, gets point for combining foot fetishism with murder. Apparently quite the ladies’ man, men’s man and equal-opportunity perv, Skiron would approach people on the path between Attica and Megaris and convince them to wash his feet. While performing this task — and keep in mind that wearing sandals on an ancient Greek highway would not make for pleasant feet — he’d kick them off a cliff, at which point a tortoise would eat them. I think the Getty Villa’s visual aid illustrates this process nicely. And then, of course, Theseus killed him. 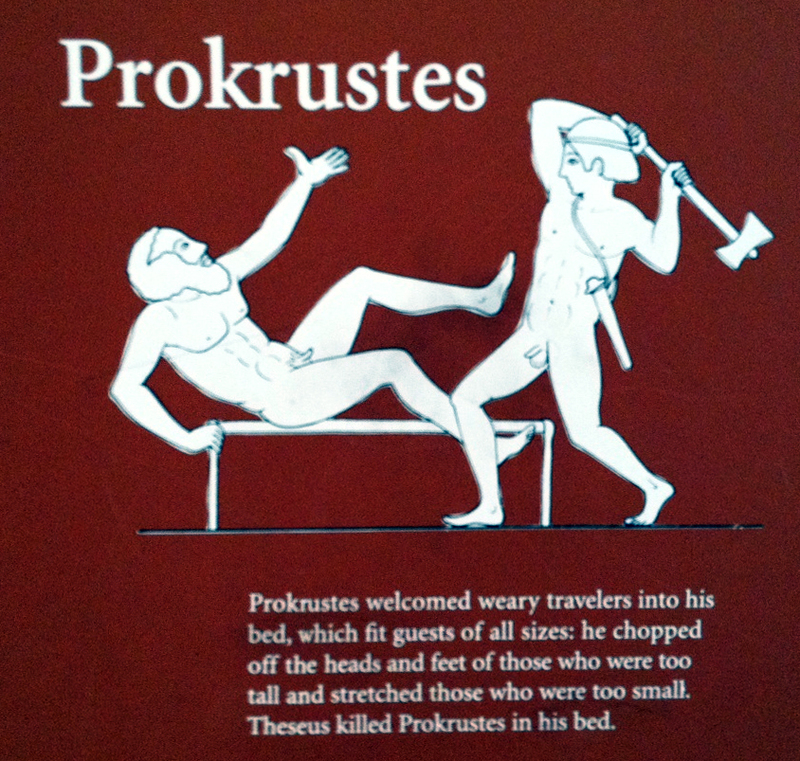 The second, Prokrustes, would trick travelers into staying in his Guest Bed of Body Dysmorphic Horrors. If the guests were too tall, he’d lop off their appendages until their fit snugly in the bed. If they were too short, he’d stretch them. And in case you think that Prokrustes might spare the rare travel who fit the bed perfectly, he wouldn’t. There were two beds. Again, the Getty Villa supplies a visual aid. Also, I'd love to see an '80s-esque slasher film about the Prokrustes story, especially. It's kind of like a twisted version of Goldilocks and the Three Bears, isn't it? Well, sort of. See, I think the role would be best as a Martha Stewart-type who forces anyone and anything to conform to her rigid expectations. You know, if that exact movie hadn't already been made so well as Serial Mom. Then there's the original "The Stepfather," too (no, not 2--shudder). Forget Locke, Terry O'Quinn will forever be a madman smashing Shelly Hack in the face with a phone receiver while saying, "Wait...who I am here?" for me at least. But I am old. Yeah, anyone who ever trusted Locke had obviously seen "The Cutting Edge" and not "The Stepfather."